We locally source bamboo poles that have been selected from mature groves and harvested using proper techniques and standards to ensure the highest quality in the world. Unlike imported poles that are sprayed numerous times with toxic chemical demanded by importation restrictions, our poles are untreated and organic (uncertified). Poles are perfect for gardens, construction projects, crafts, children's toys, and a thousand other uses. Meyeri - strong and straight - medium sized. All around good for construction, especially smaller diameter sizes usually recommended for building things where children are involved. Vivax - good wood quality with large diameters but thin-walled and prone to splitting. Ideal for crafts using half-rounds. Yellow Groove - soft wood quality only good for temporary projects. These are usually custom orders and sold at a discount. Japanese Timber (aka Madake) - Highly regarded for its strength and straightness. The price list below is the per foot cost, cut to the length you determine. We can cut your bamboo to any length from 6" to 15'. We also have the ability to split bamboo vertically (to create half rounds) for an additional price of $1 per foot. Cuts for many small pieces are additional cost. We are happy to help you with your larger custom orders. Please contact us for a quote. Since bamboo is a natural product and will vary in size. We measure with tree calipers at the middle of the pole. It will tend to be slightly larger at the bottom and slightly smaller at the top. The middle measurement can varies by 1/4" less or 1/4" more than the stated dimension. Since bamboo is a natural product, all poles are crooked, though some are close to straight. Each pole is slightly different in color, though most species fade to some version of tan. Whole poles will split sooner or later, but you can reduce chances of splitting by keeping the temperature and moisture regulated as well as cutting the ends at a node. Poles do taper, and the amount will vary from pole to pole. Raw: The bamboo is green (or black or yellow, depending on the species). No other washing or drying has been done to it, although some may have been air dried for a while. ​Washed: We take raw poles and pressure wash them for the best possible presentation. Kiln Dried: Dried in a lumber kiln so they are brown/tan and most of the moisture has been removed. This helps weed out any weak poles since they will tend to split in the kiln. The kiln also kills any insects that may have attached themselves or found their way into the bamboo. Air Dried: Similar results to kiln drying, but the process takes months in a controlled environment. Length: You tell us what length to cut. We generally have most types available up to 15 feet, but can do longer poles for custom orders. Length: You tell us what length to cut. We generally have most types available up to 15 feet, but can do longer poles for custom orders. You can cut yourself at the nursery or have us cut for $2 per cut. $75 minimum for orders being shipped, not including shipping charges. $50 minimum order for any special orders involving custom cuts or access to the Burlington warehouse. 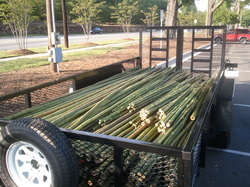 $25 minimum order if picking up available bamboo at the nursery. All prices and discounts apply to in-stock items.